Still standing at 539 Brittania Street, although stuccoed and significantly altered, the Robert and Carlota Wirsching House is one of the older houses of Boyle Heights that dates to the late 19th-century. Like many houses, the Queen Anne-style structure has an interesting story relating to its original owners. Carlota Valencia was born on 29 December 1851 on the Rancho Los Feliz in today's Glendale area. Her mother was a member of the Feliz family, which received the rancho as one of the first Spanish land grants back in 1784. In 1870, she was living in Los Angeles with a brother, Ramon, who was a tin smith. A decade later, she was residing on Aliso Street in the home of saloon keeper Norbert Des Autels. Because she was unusually well educated for Latina women of the period, Carlota was a longtime teacher in the town's schools. Until, that is, she met the man who became her husband. Robert E. Wirsching was from the duchy of Saxe-Meiningen in Germany, where he was born on 15 February 1846. At the age of six, perhaps due to the turmoil of revolutionary politics in Europe, his family migrated to the United States and settled in New Haven, Connecticut. Wirsching's father, Martin, was a painter, a trade that Robert took up in his teens, although he also developed an interest in photography. In 1870, young Wirsching was in nearby Milford, and worked as a painter for carriage maker Samuel Beecher. Within a few years, however, as Los Angeles was at the peak of its first growth boom, Wirsching relocated to the growing town, arriving in 1875. He went to work for a carriage maker before forming a partnership with Englishman Samuel Rees in business on Los Angeles Street that did blacksmith work and wagon making before branching out into the manufacture of agricultural implements. The company was a great success, particularly as the Los Angeles area underwent an enormous period of growth after the late 1880s. Rees, in fact, was an early investor in land at Brooklyn Heights and Boyle Heights and built his home at 632 Brittania, just a block or so from Wirsching. 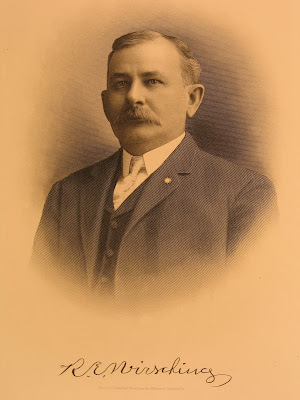 Rees served on the Los Angeles City Council in 1891 and 1892 and was instrumental in persuading the council to accept Hollenbeck Park into the developing city parks system. As for Wirsching, he, too, went into politics and was Rees' predecessor as the councilman for the Ninth Ward during 1889-90. He followed this with terms on the fire (1893-94) and police (1895-96) commissions, before securing election as Supervisor for the second district in the county, serving in this office from 1896 to 1900. He did intend to seek reelection, but a falling-out with the Republican Party leadership led to the withdrawal of his nomination. Later, however, Wirsching was appointed to the Board of Public Utilities, which oversaw what is now the Department of Water and Power. He remained a member of the board until his death in 1921. Robert and Carlota Wirsching were married in July 1880 and had four children: Rose, Robert, Carl and Ernest. The family lived at their Boyle Heights home until sometime in the 1910s when they relocated to a residence on West 27th Street near Grand Avenue in South Los Angeles. Mrs. Wirsching remained in that home until the 1930s and died at ninety years of age in early 1942. The photos of the Wirsching house are from the collection of the Workman and Temple Family Homestead Museum, City of Industry. The portrait of Robert Wirsching comes from James M. Guinn's Los Angeles and Its Environs (Los Angeles: Historic Record Company, 1915), Volume II, page 267. I grew up in Boyle Heights in the late 1950's and lived there until 1979 when I married. My grandmother purchased the home I grew up in in the early 1950's, I believe. The house was (is) at 1907 E. 4th St., on the corner of State St. The house is still there, however it has been refaced and no longer looks like a Victorian. So sad. I do remember some of the homes that are posted here. I went to Second St. School and graduated. My closest friends were Jewish and Japanese. Great memories! I took violin lessons at a music school that was in a beautiful Victorian home on Boyle Ave., south of 4th St. Thanks for sharing some history of my childhood home, Boyle Heights.